NIMS Apprenticeship Trial Underway | KLH Industries Inc.
Four companies are piloting a new apprenticeship standard for metalworking in Wisconsin. 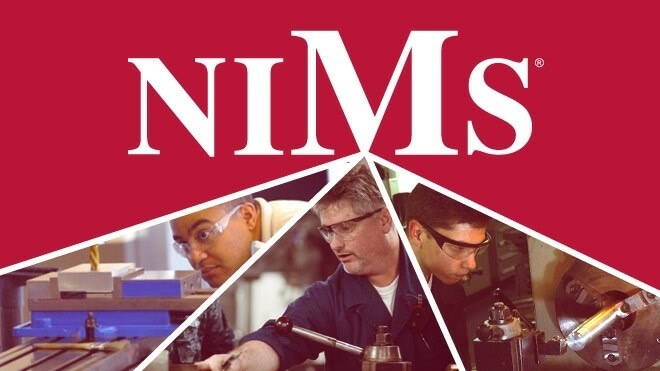 Toolcraft, Integrity Wire EDM, KLH Industries, and Versevo have all volunteered to trial a competency-based apprenticeship program developed by the National Institute for Metalworking Skills (NIMS). Wisconsin’s current apprenticeship model, established in 1911, combines theory learning with a minimum hourly requirement of on-the-job training. For example, the “Machinist” apprenticeship requires 8,320 hours of on-the-job training spread across nine categories. Aside from basic category descriptions, there are no defined requirements or field tests. The assumption is made that time breeds competency. The effectiveness of those hours, in truth, can vary greatly due to the employer’s scope and interpretation. In the NIMS model, time is irrelevant. Each NIMS apprenticeship consists of specific skill requirements, called credentials, which are categorized as beginner (Level 1), intermediate (Level 2), or advanced (Level 3). There are 52 different credentials spread across 13 professions. The current pilot only includes Machining, Die Making, and Mold Making because they share the same Level 1 credentials. Each credential can be taken as part of the apprenticeship program, or as a stand-alone certificate. The credentials are designed to be modular, meaning employers can select the skills that are relevant to their line of work. To graduate as a NIMS-certified apprentice, students must complete the credentials for all three levels. Supporters of NIMS are calling it “fast-track” education because students can learn and advance based on their own pace and background. In theory, it is possible for students to skip certain credentials or even entire levels, provided they have the required competencies. One of the biggest local supporters of NIMS is Kenneth Heins, CEO of KLH Industries, a precision machining company in Germantown. Heins has served on the State Machine Tool Apprenticeship Advisory Committee (SMTAAC) for 16 years, and is the apprenticeship chair for the Tool, Die, & Machining Association of Wisconsin. Heins describes Wisconsin’s manufacturing industry as a “conglomerate of small businesses” that have learned to grow their own workforce. A recent SMTAAC study shows the number of manufacturing apprenticeships offered by employers has decreased 65% since 2000. Less companies than ever are participating in the apprenticeship program. That's what NIMS is to me. A better, quicker way to produce skilled manufacturing labor. Technical colleges have been gravitating towards competency-based curriculums for several years. Most already have the instructors and equipment necessary for NIMS. For the pilot program, only Waukesha County Technical College (WCTC) is accredited to teach NIMS. The current apprenticeship program only requires schools to teach machining theory, with no hands-on learning. Most technical colleges go beyond the state requirement by supplementing theory with applied learning. When these hands-on classes are offered, students only have to machine enough of a part to receive a passing grade, which is 70% or above. Heins argues that a traditional grading model doesn’t provide “real world” preparation. In the NIMS program, there is no room for error. Every student is validated against a series of written and “chip-making” exams, where they use real-world machines to manufacture a specific part. Students must correctly machine all features of the test part or start over. This prevents students from moving onto the next credential without demonstrating every competency. Although the NIMS program is being labeled “fast-track” education, seasoned machinists shouldn’t expect to breeze through the program. The NIMS program is challenging Orsborne to learn fundamentals he did not learn at his previous job, like operating manual equipment. Orsbone admits he is behind on certain skills, but finds the education rewarding. Ed Janecek, Instructor of Manufacturing Technology at WCTC, echoes the rigors of the program. Janecek says the NIMS program is a dramatic improvement to delivering and conducting apprenticeship training. The future of NIMS in Wisconsin will be decided in May, when the Bureau of Apprenticeship Standards meets with the State Machine Tool Apprenticeship Advisory Committee. Heins expects the result will be a second pilot group, starting in Fall 2014. Employers are already lining up apprentices for a second pilot, should there be one. Three apprentices have already committed, with nine openings remaining. Should the NIMS model be rejected entirely, the students in the pilot program will have their hours transferred to the current apprenticeship model. According to Janecek, that seems unlikely.